As is often the case , prototypes are an attempt to improve and get better. 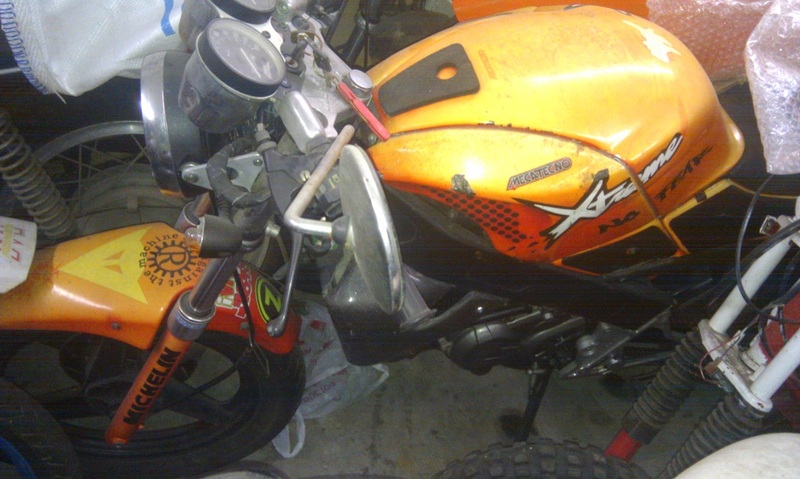 By their pure nature , if a motorcycles remains a prototype that did not go into production , then it was not good enough. 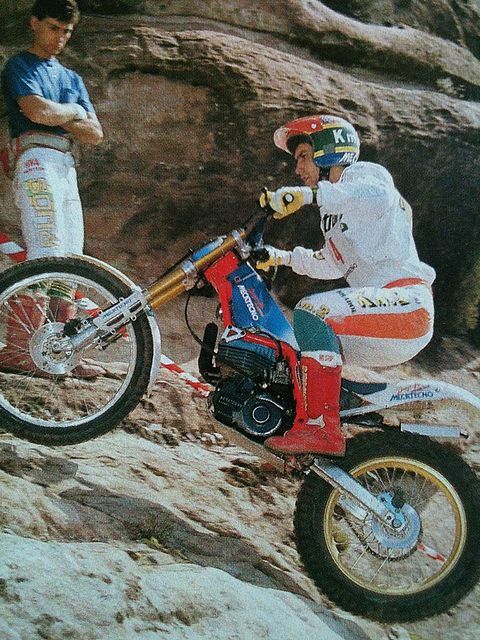 This Dragonfly is pictured in 1988 with rider Lluis Gallach.This is the first time the Dragonfly was seen fitted with different suspension.This World Championship model was fitted with upside down Foral units which would later be fitted to the Skywalker. Melcior Estorch on the Mecatecno Dragonfly , fitted with Prototype upside down Foral forks. These would be fitted later to the Skywalker. 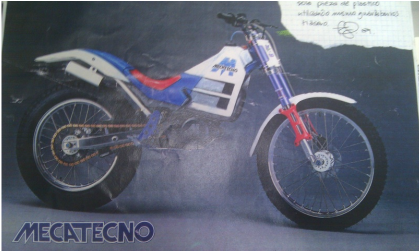 This is a design drawing for the 1991 Mecatecno Skywalker.There were due to be substantial changes to the plastic styling and colours. Other changes are not detailed. This Mecatecno Extreme 125cc was built in very small number in 1996 .it was produced using a 125cc Piaggio 4 stroke unit. It is the property of Jordi Rabasa's grand son. He's since moved onto cars and the bike remains in Jordi's Mecatecno store. 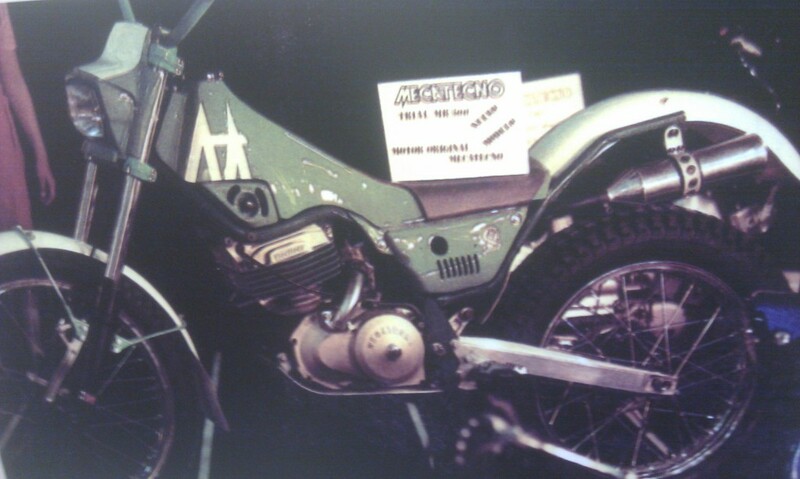 The photo above to the left is the prototype 326cc Mecatecno on display at a 1983 show. Every aspect of this was made at the Els Xops factory.The tanks and side panels were all made in fibreglass. 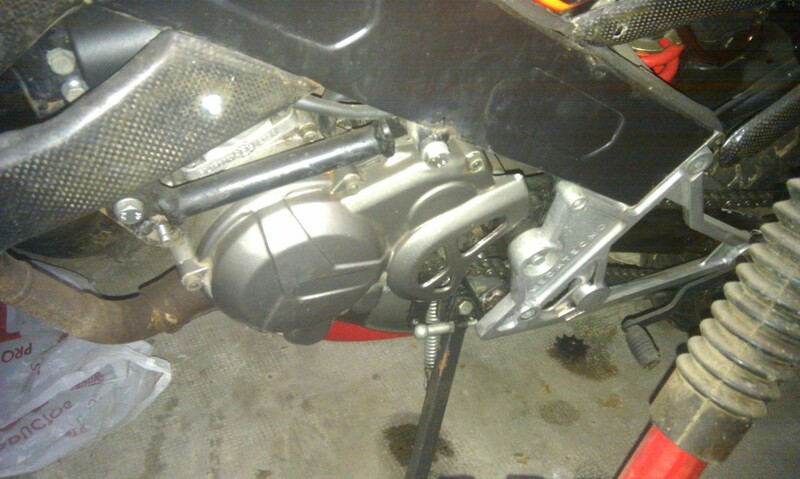 The air box was fitted into the tank. The idea was later changed to a more standard air box , as the channels under the tank and within the body work did not feed enough air to the engine.This prototype differed from the production model in many small ways (different silencer,no gear lever , plastics etc), but maintained the roughly same look.